Council for Legal Education Tours MSU!!! Home /Featured, News/Council for Legal Education Tours MSU!!! The Council for Legal Education has toured the Midlands State University to conduct an annual assessment of the quality of education offered by the Faculty of Law. The Council is Zimbabwe`s regulatory authority for supervising legal training in all academic institutions in the country. Midlands State University is one of the two institutions designated by the Council for Legal Education, which means that graduates from the Faculty can automatically register as lawyers soon after completing their studies. The assessment focused on the student to teacher ratio, library facilities, qualifications of lecturers, examinations, office space, external examination and the nature of the modules. 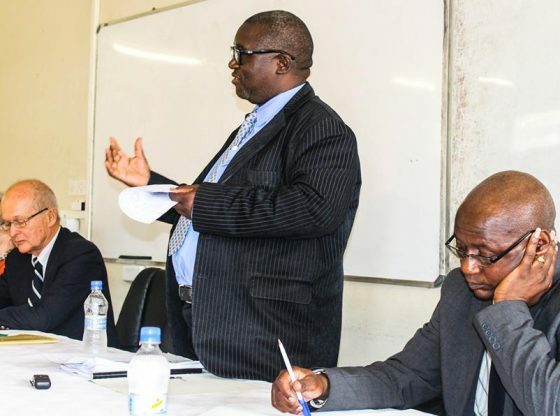 The Executive Dean of the Faculty of Law, Dr Gift Manyatera said after the two-day assessment tour, the sub-committee will present its findings to the Council, after which a report will be compiled highlighting the positives as well as the areas that may require attention by the University. ‘One of the issues that came out of this discussion is the year-long duration of work-related learning in light of our requirements in the profession, so there has been a debate on whether it’s adequate or it should be reviewed,’ he explained. The sub-committee also took time to discuss with students their perspective on the quality of the programmes offered by the Faculty. Midlands State University has 333 undergraduate students, 60 masters students as well as 60 Diploma students all under the Faculty of Law. The Faculty 16 full-time lecturers, 4 part-time as well as two teaching assistants and is a member of the International Association of Law Schools among other foreign professional bodies. Dr Manyatera expressed optimism that the Council will be satisfied with the high standards set by the university which has re-affirmed its commitment to maintaining high standards. ‘A lot of effort has been put, of course with the support from the University management in making sure that we are well resourced. From the tour of the library, it became apparent to everyone that we have a well-resourced library. It can match any standard in terms of resources especially with regards to e-resources. It is unparalleled in this country when it comes to legal education,’ added Dr Manyatera. During the two-day tour, the delegation led by Professor Julie Steward paid a courtesy call on the Vice-Chancellor Professor Victor N. Muzvidziwa. A public lecture was also arranged for the students after which they had a question and answer segment with the panel which included High Court Judges Justice Mathonsi and Justice Zhou.